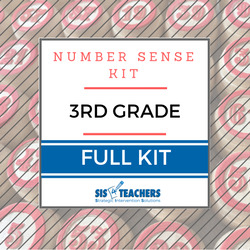 This Number Sense Kit supports the 3rd grade classroom, and is suitable for 30 students. Kits are assembled and labeled, ready for classroom use. Kit items are also sold separately. Please note that digital items can be downloaded from the confirmation page immediately after placing your order, from an email with the subject line "Files ready for download — SIS4Teachers" from shannon@sis4teachers.org, or in the order history in your SIS4Teachers Store account.